Day 5: (April 18, 2010) Today I contacted Charities and other organizations to inquire about donations and to schedule pick –ups. Researching all the necessary information is all part of the masterful plan of organization. I chose the Lupus Foundation today because their next available trucking route in my area worked for me. They will take just about everything, except upholstered furniture. I am so happy and grateful that I can get rid of so much clutter all at one time. So much easier than separating categories. So far, this is good…nothing hurts yet. This is all EXCESS, easier to purge. I have only just begun. I need to dig deeper. Need to keep going. As for the stuff that I want to keep, I need to devise a plan so that the packing process will be organized! Thought it would be productive to begin physically packing those things that are not immediately useful to me, nor need to be accessible in the near future. So I am starting with my basement: the Lower Level (which was designed to function as an alternate living space with den, media room, linen closet, toy and craft closet, small kitchenette with microwave and fridge, full gym, large storage closet, full-bath, and bedroom). There is an additional storage closet that houses a fourth and fifth set of Holiday dishes, stemware, platters, pots and pans, silverware, etc. Think this is a good starting point. Together, with my family, we will sort and purge as we go, determining what possessions we will need to pack. I am going to create a packing station on my “soon to be” donated ping-pong table in this lower-level zone. It will be where I will sort, organize and assess what I am keeping and packing, what I am donating, and what is to be recycled or trashed. This is what I will designate as my hub of the packing process for items on this level only. I will need to create similar hubs for each level of my house so that I can have an easy and direct access for sorting and packing. No reason to run up and down three flights of stairs, carrying items and delivering to only one packing area. So this is my plan: I’m going to divide the “pack” into Three floors; The Lower Level, The Main Floor (Center Hall, Hall Closet, Powder Bath, Dining Room, Kitchen, Laundry Room, Pantry Room, Bar Room, and Den, and Maid’s Room); The Upper Level: Master Bedroom and Bath, three bedrooms, second full-bath, and linen Closet. I will create a manifest list where I will list all items packed and cross referenced with a colored dot system. Those boxes that are moving to the new space, will be assigned a color for a particular room so that it can be easily delivered to the corresponding designated space. With this system in place, it will be easy for both the Movers and I to be organized and efficient, and enable the unpack to run more smoothly. Glass Vases: (refer to above photos). Over 31 years of marriage, celebrating anniversaries, birthdays, and holidays, there has been a joyful parade of floral arrangements coming into the house, married with a myriad of glass vases in a variety of sizes. “Clearly”, (no pun intended) one household does not need to compete with the local florist. Note to self, need to downsize from the 40 vases, seriously. Time to purge. Additional Items to address: Tupperware, Hotel freebies (body lotions, conditioners), excess kitchen gadgets never used, excess kitchen utensils (too many options), array of wire hangars, an excessive amount of coffee mugs in variety of sizes and colors, as well those wicker baskets (so unique in size and shape they do not nestle nor stack). Discriminate and eliminate! I was going to inquire at my local florist to see if they wanted to take my vases back, but thought that a charity could really benefit from them ,maybe utilize them for centerpieces at their fundraisers. 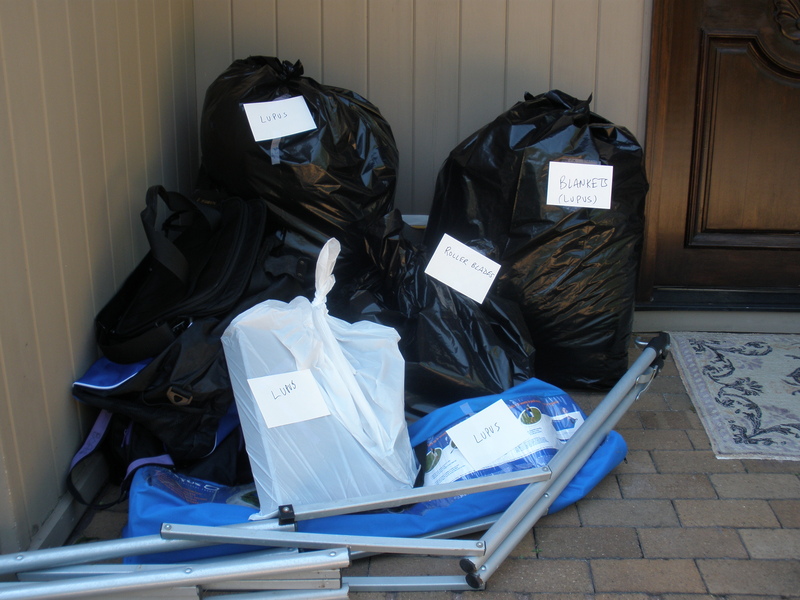 Called Lupus Foundation , arranged for the pick-up and set aside an area in my hallway for its pile. Day 3: (April 15, 2010) Today is the day for designing a plan, which means I have take the emotion out of the equation. The reality of MOVING THE MESS is NOW! OMG and I have way too much stuff. So initially I’m thinking, an effective starting point would be to address the excess…the clutter…the stuff I don’t really need, nor will I miss, (which translates to: the kid’s roller blades, bicycles, tennis rackets, basketballs, hockey sticks, art supplies, board games, etc.). Just because I don’t need them anymore, someone else surely does. This is easy. If I know that other children can enjoy these things, it feels great to let it go and donate to an appropriate charity. Ditto to their clothing, saved Halloween costumes, knapsacks, sleeping bags, baseball caps, clothing, and sports memorabilia no longer cherished. OK, now we are moving……(not literally, of course, but at least in my head). With respect to the grand scheme of “organizing” (i.e. sorting, weeding, and purging), I would be remiss if I didn’t factor being ”green” into this equation. Let me mention, that as an Organizer and a conscientious consumer, it is my responsibility to Reduce, Reuse, and Recycle. 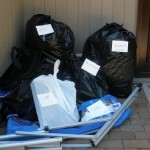 It would be so easy to simply decide “trash” or “treasure” and overflow the dumpster with those items I no longer need. But we all must be accountable for our stuff and mindful that clearing our clutter means recycling or donating, not dumping it into our Earth’s landfills. I get it, and I can only hope the rest of the world gets it. If someone out in the world can benefit from our undesirables, wouldn’t that be a more gratifying option? Think of it as re-gifting. Day 2: So I’m walking around the house, peering into each of the rooms, and I KNOW and recognize that everything in every room must go. In my rational thinking, I know that I should just start physical packing, room by room. But suddenly, as I enter each space, a flood of memories interrupt the thought. I walk into my daughter’s room, and open her closet, and realize that it appears that she still lives there! Apart from her “off- season” clothes, there are her childhood collections, her personal photo albums, favorite books, childhood collections, an endless amount of memorabilia. Of course, everything is boxed and labeled…It’s ORGANIZED, of course …I organized it! I saved all her paramount school projects (labeled by grade level from Kindergarten through High School), saved and boxed camp letters, Bar and Bat-mitzvah give-aways, Sweet 16 Birthday cards and memory candles, and even her cheer-leading pom-poms!! So how hard could it be? First lesson learned……. just because I don’t have the overwhelming task of organizing it all (probably like most) doesn’t make the “parting” any easier. I look at her bed, and I tear up, recalling the incalculable nights that I either tucked her in, or rescued her from a recurring nightmare, or enjoyed our typical tender moments together. I didn’t need to go any further to realize this was going to be a circuitous pattern with any room I entered. My footprints and heartstrings are engraved and attached on every wall, on every molding, in every drawer, and memory stains on every quilt. When I proceeded to my son’s rooms, a new litany of emotions smacked me in the face. There were so many framed photos of HIS past, HIS life and friends, that both he and I clearly have no room for. Do I just box, label, and store as buried treasure? Is this all just clutter? How could we have accrued so many baseball hats and team jerseys for just one little head and one body? Shouldn’t I keep his first Home Economics Project (a hand-sewn fabric shark) to show his future child one day? I am struck with how “priceless” some physical memories are to us. Interestingly, I have less issues with the parting of the innumerable sport trophies that are merely collecting dust and that were awarded to every athlete that was on the team of that particular sport. But that said, I am very cognizant that this move is not going to be “slam-dunk”….This is not going to be easy. As I prepare for bed, I intentionally distract myself from thinking about down-sizing my own bedroom and the challenges that will eventually ensue, until I enter the spacious walk-in closet with all my customized particulars, and sigh, realizing I cannot take the built-ins with me. But that’s for another day. Time for bed, and hopefully sleep. 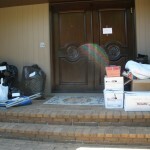 PROFESSIONAL ORGANIZER OF “MOVE THE MESS” IS MOVING HER “OWN” MESS! Day 1: (April 14, 2010) After 27 years of living in a home on Long Island, raising two children, accumulating all the “stuff” that goes hand in hand with that memorable journey…The time has come to let it all go. Yes, the kids have moved out on their own, (although their “stuff’ has not) the big house is quiet, and with the prodding of my husband and countless conversations, I knew that it was time to down-size. Today is that day, contracts have been signed, we have officially sold the house! At this time, we are looking into renting a smaller, temporary, living space. We don’t have a lot of time so it is time to get organized!! And so….it is finally, time to MOVE THE MESS! One would ask, where do I begin? How long will it take to pack? What do I keep? What do I trash? What and where can I donate or recycle? 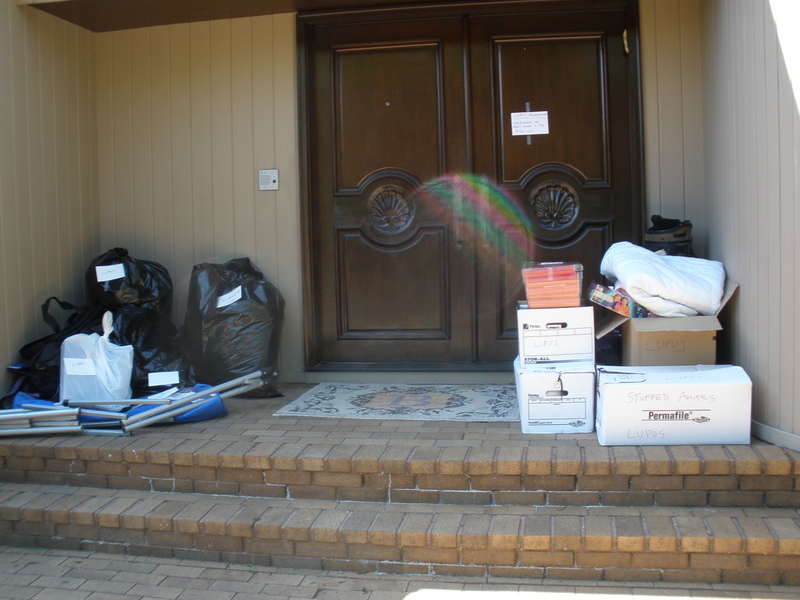 How can I rid myself of those precious sentimental items that I no longer have room to store? Will I need to use storage facilities? How can I make this an easy and pleasant transition for my family? Does this experience need to be a stressful one? Who would have thunk it? Over 4,000 of us across the country? Are you kidding me? What did I get myself into? OMG….a wealth of information and education, that’s for sure. There are teleclasses and webinars, conferences, chapter meetings, books galore. The greatest challenges and biggest buzz about organization, is tackling the clutter. If there’s too much stuff, it can distract you from living a healthy, high functioning orderly life, and that means trouble on so many levels. Bottom line, de-clutter your life. As a Professional Organizer, my role is to aid you in letting go of the “stuff” you no longer use, identify those items that no longer serve a purpose, and to then recreate a new “order” to your life as you live it today. It’s all about shedding the old stuff. So I’m thinking, this is an invaluable exercise for me to trade places, if you will, with my client, and more importantly, share my real life experiences with you. What makes this task such an arduous is one, is that ” I” am the subject in this project. Conversely, when I would be working alongside a client, I would have to be the objective eye (“Eyes of a Stranger”) that treats the project as an abstract one. My mere presence would change the whole dynamic. I would force the client to view from an objective vantage point, and focus on their organizing issues, not on their emotions. Today, I am not orchestrating from the sidelines, I am very much “in the game”. I’m prepared to document “the move” from start to finish so you can shadow this project as I go. This is a great lesson for me, do I practice what I preach? Can I “walk the walk”, or just “talk the talk”? How hard could it be for an Organizer to organize?